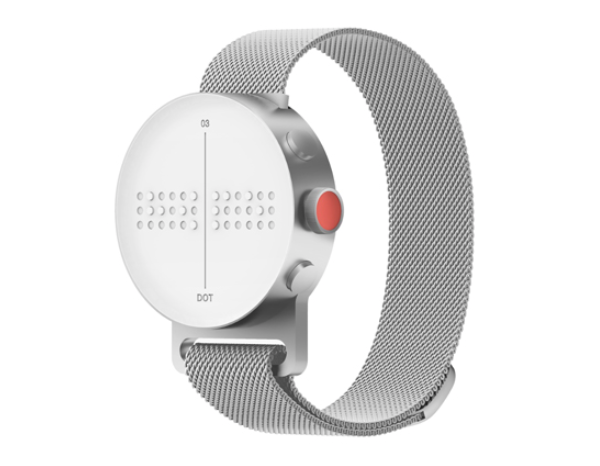 The world’s first braille watch. The minimalist design features a moving keyboard that displays braille text in real time so you don’t see time flying by, you feel it. The Dot Watch can be connected to a smartphone application called the Dot Watch App, to receive information such as GPS navigation, call and text message notifications, as well as the date and time. Made from silver aluminum, the watch utilizes four electro-magnetic actuators that seamlessly relay information through textural dots. Powered by DOT’S patented technology, this is the first time that an active braille technology is put into motion and integrated into a mobile form, the perfect balance of design and accessibility. In the permanent collection of the Cooper Hewitt, Smithsonian Design Museum. YEONGKYU YOO, the founder of cloudandco as well as the creative director, has various experience of design with successful achievements for 20 years. As a creative director at Microsoft, he significantly contributed designing HoloLens and Xbox, and its envisioning. Also he was introduced as one of four designers leading Microsoft: “Meet four people who are designing the future of Microsoft”. Before that, He was the creative director of iriver, after working at NIKE WHQ. His works have been featured in Wallpaper Magazine, The New York Times magazine, and he has participated in many global campaigns such as MUJI’s Enjoy! ( ) Energy project as well as Japan Creative + Elle Decor’s Simple Vision project. Awards He won many of IF Design Award, 3 Golds, and Red Dot Design Awards, D&AD, Cannes lions, Good Design Award Japan and IDEA Award, Silver. Exhibition He exhibited Beauty at San Jose in 2015 as well as at Cooper Hewitt national design museum in New York 2014, Asia talent Bangkok in 2013, Japan creative “simple vistion” in Milan & Tokyo 2012, Muji Enjoy! ( ) Energy in Tokyo 2012 and Less than nothing in New York 2006 (Material Connection).